Are Korg’s Bluetooth Nanos the ultimate mobile MIDI controllers? 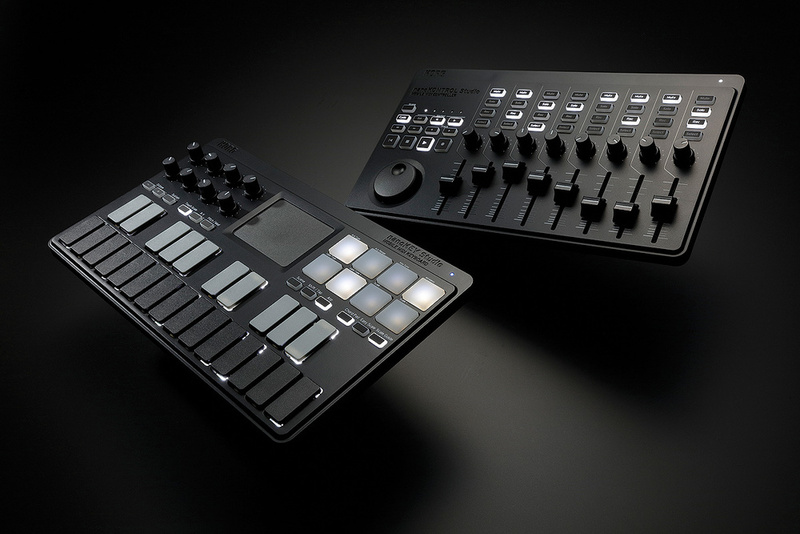 Korg’s two new Nano Studio edition controllers expand on the existing NanoKeys 2 and NanoKontrol 2 in both size and functionality. Though somewhat less ‘nano’ they are still eminently portable, especially as they offer wireless Bluetooth connection to computers and iOS devices, and can be battery powered. 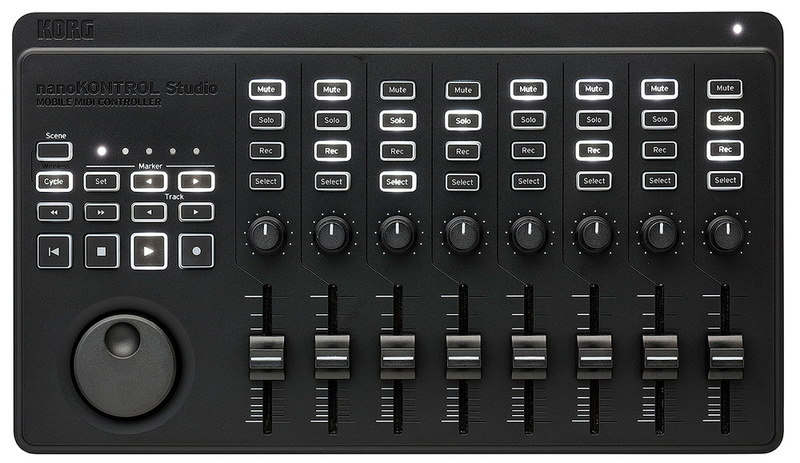 The NanoKontrol Studio.Compared to the Kontrol 2, the Kontrol Studio is spread into a more comfortable layout with the Mute, Solo, Rec and select buttons moved out from between the faders and up into the more traditional position above. This makes the unit around twice as deep, but shaves a couple of inches off the width, leaving a footprint like an elongated iPad Air. The faders are longer throw, and all buttons have cool white backlighting. 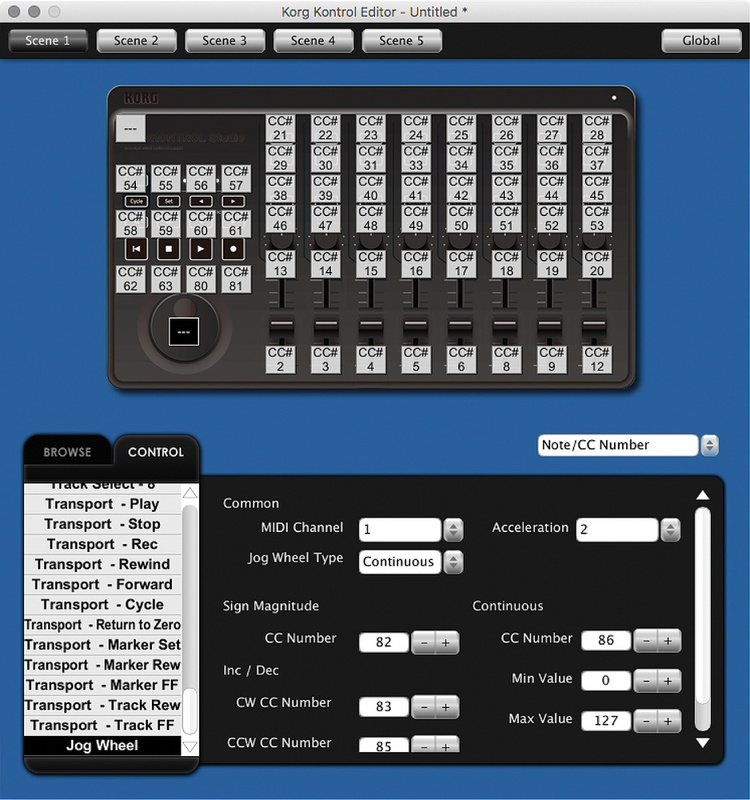 The other main physical differences are the jog wheel and a Scene button, which toggles the whole surface through five separate controller assignment pages when used in stand-alone MIDI mode. The NanoKey Studio.The NanoKey Studio takes the two-octave keyboard layout from the NanoKeys 2 and adds eight knobs, eight trigger pads and an X-Y touch controller. It also offers considerably more functionality, with eight assignment scenes, scale and chord modes and a built-in arpeggiator. A switch on the back of the devices selects either USB or Bluetooth mode, and can also power them off, which is helpful for conserving your batteries. I followed the instructions to connect to my Mac: a slightly different procedure to a Bluetooth mouse or keyboard as it’s done via the Audio MIDI Setup utility. Pairing was quick and easy, but I found that I had to repeat this process after a restart. This was aided by installing a small taskbar utility with a shortcut to the Bluetooth settings. With iOS devices, the Nano Studios connect via Bluetooth in System settings like any other Bluetooth device. You can then use them as generic controllers with any app that supports CoreMIDI. 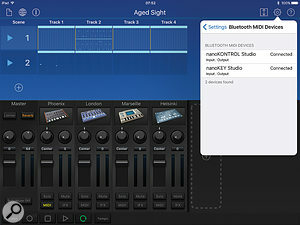 However, some Korg apps support the devices directly, allowing direct control over the Bluetooth connection, and offering more integrated functionality. On occasion I had frustrating connectivity issues: I found the Bluetooth connectivity sketchy as the batteries got low, and the units were also fussy about which USB cables I used. My iOS testing for the NanoKontrol Studio was predominantly in Korg’s own Gadget app; mainly because this was the only app I could find that supports it out of the box. My other Korg apps, iMS20 and iElectribe, both have a ‘Native Nano’ mode, but they’ve not been updated for use with the Studio editions. For example, in iMS20 the original NanoKontrol can control the part mixer, among other things, but the Studio does nothing, not even transport. I couldn’t find a way to use the Kontrol with GarageBand, which is probably the most widely used iOS music package. Korg’s Gadget has built-in support for the Nano Studio devices on both iOS and Mac.Korg’s brilliant iOS toyshop of synths and drum machines is definitely enhanced by the NanoKontrol Studio. Transport, mixer and track selection can all be controlled from the hardware. I was a bit disappointed that several buttons were unassigned; it would have been great to use a couple of the buttons to step through Scenes, for example. The track selector is also non-functional, and would have been very useful. The more generic nature of the NanoKey Studio made it a lot more widely usable on my iPad than the Kontrol. I had it working with a variety of synth apps, as well as GarageBand. It was also great fun to use both controllers together with Gadget and set up a little portable workstation. 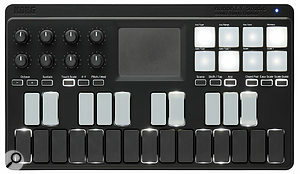 Gadget LE is included with the Nano Studio controllers, along with the LE version of Korg Module. Again, it was a bit disappointing that the Native modes in the Korg apps didn’t appear to function as expected. In iMS20, most of the knobs did stuff, although the mapping seemed random. Worse, I was unable to map the X-Y to the Kaossilator pads in the FX section. Hopefully it won’t be too long before someone shares some Kontrol Editor maps for use with different apps. 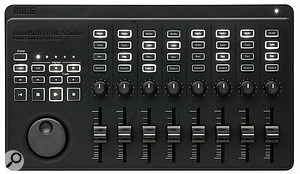 When connected to a computer the Kontrol Studio has different modes for use with specific DAWs, a general stand-alone assignable mode, and connects natively to Gadget for Mac. The Cubase, Live, Studio One, Sonar and Digital Performer modes are all essentially Mackie Control emulations, and there’s a Pro Tools mode that uses the HUI protocol. These days it comes as a surprise when there isn’t a dedicated device profile for Live that would allow for automatic setup and dynamic control mapping. 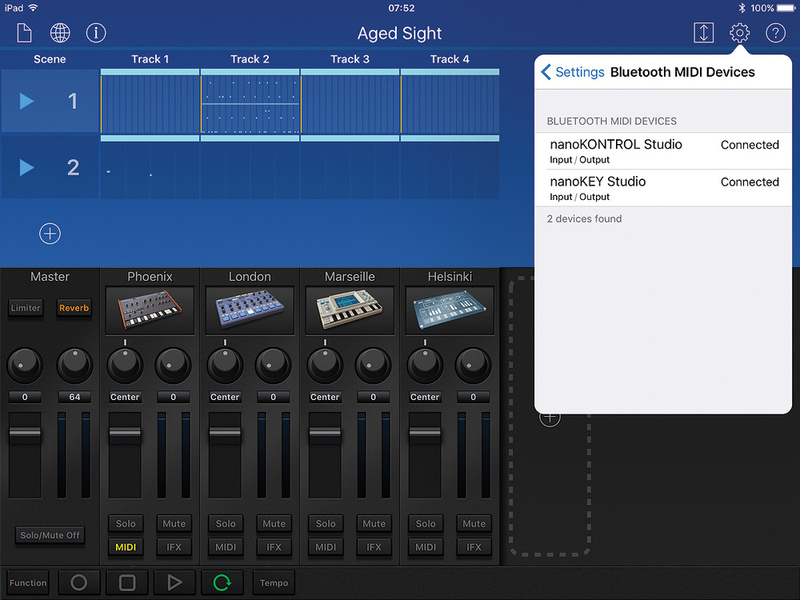 Logic and GarageBand are, however, supported directly with a supplied controller plug-in. There’s no mention of Reason (which is strange as Reason Lite is the one bundled DAW), but it does work up to a point via the Mackie emulation. In Live’s Session view you get bankable mixer control, but no Device control. The jog wheel scrolls up and down the Scene list, but provides no means to actually trigger the selected Scene. In Arrange view the jog wheel moves the play marker and the Marker buttons work effectively at setting position pointers and navigating between them. 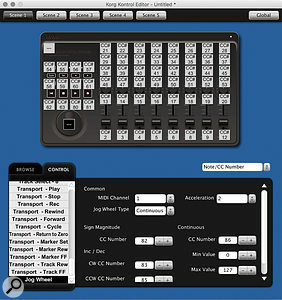 The functionality is similar in all the other DAWs: mixer control, transport, and navigation with the wheel. In all the DAW modes the Scene button has no function. Gadget control is identical to the iOS version. 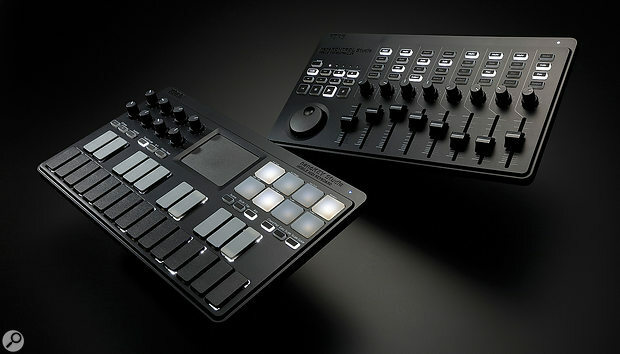 Korg Kontrol Editor lets you assign multiple scenes on both controllers.In stand-alone MIDI mode you can use the supplied Korg Kontrol Editor to set up five layers of assignments of Note or CC messages. The wheel has a more detailed setup page that should cover most eventualities. The Scene button tabs you through your different assignment pages, with a row of five LEDs showing you where you are. Unfortunately, switching between each of the DAW modes and stand-alone mode requires that you restart the device while holding down various button combinations (which I had to look up in the manual every time). It’s a real shame that you can’t toggle between DAW and stand-alone mode on the fly and get the best of both worlds. As it stands, the majority of users will probably never use the powerful multi-scene mode. The NanoKey Studio functions like a generic MIDI keyboard when connected to your computer. There’s no Logic plug-in this time, and again no Live remote script, so any knob assignments will need to be manually mapped. There are, however, eight available scenes to switch between, which you can adjust with the Kontrol Editor if necessary. The keys themselves are the same as on the regular Nano: large buttons that feel like keys on traditional ‘clacky’ computer keyboards. They won’t be to everyone’s taste, but they do allow Korg to cram two octaves into a tiny space. Unlike a computer keyboard they are velocity sensitive. A nice touch is the Sustain button, which works in place of a footpedal. As a MIDI keyboard there’s a lot of functionality on offer that you wouldn’t see on many full-sized keyboards. There’s a built-in Arpeggiator with multiple types and gate patterns that you select via the Shift key and drum pads; as you cycle through the options the backlights on the keys animate to show you the pattern. You can also use the pads to set up a Scale and Key for use with the Easy Scale and Scale Guide functions. Easy Scale maps your chosen scale and key to the ‘white’ notes on the keyboard (which are actually black). Scale Guide leaves the keys in their default chromatic assignment, but uses the backlights to indicate your selected scale. Finally, there’s a handy Chord Pad mode that plays chords with the drum pads. In Easy Scale mode the black (grey) keys on the keyboards also play these chords. The touch pad is an unexpected bonus in a mini MIDI keyboard. This has three separate functions, selected from the buttons below it. In Pitch/Mod mode the pad takes the place of pitch-bend and mod wheels. In X-Y mode the pad becomes a flexible controller, sending two sets of CC data. This was easy to map in Live and in various plug-ins, and was lots of fun. Finally there’s a Touch Scale mode where the pad is used to play notes. While sacrificing some of the extreme portability of the previous Nano devices, the Studio models gain an unprecedented amount of functionality for controllers that fit in a laptop bag. Bluetooth connectivity and battery power also mean zero cables to carry around and lose. The NanoKontrol Studio works well with most computer DAWs, although has a limited repertoire on iOS, and is held back by lack of ability to mix the fixed DAW and User modes. The NanoKey Studio works with anything and is a great ultra-portable all-rounder. 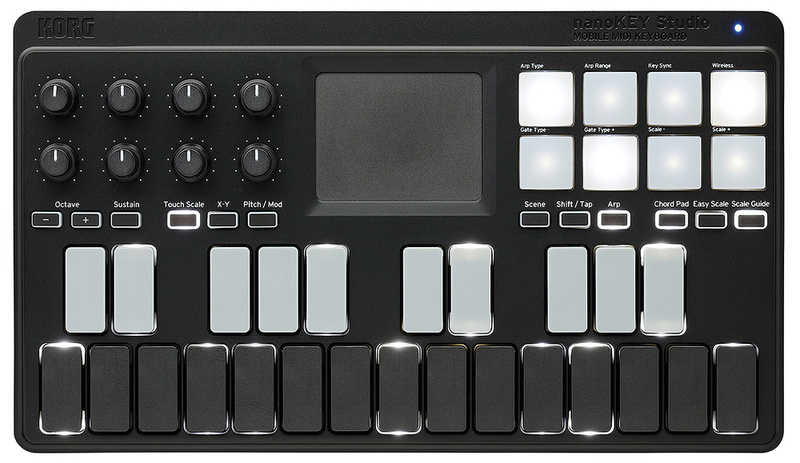 There are very few MIDI controllers that offer Bluetooth connectivity. Korg and Akai both have simple Bluetooth keyboards, the MicroKey 2 Air and LPK 25 Wireless respectively, which have more traditional keys than the NanoKey but none of the extras. For a premium price there’s CME’s slimline XKey range. I can’t think of anything comparable to the NanoKontrol Studio with a wireless connection. If you can live with USB, then there’s a lot of other comparable options at a lower price from Korg, Akai and Novation in particular. Finally, it’s also worth checking Korg’s Taktile 25 which is like a combo of both the Nano Studio devices, albeit in a chunkier, USB-only package. Lots of features packed in. Native support in Gadget/Gadget for Mac. Didn’t always re-connect over Bluetooth. Lack of Ableton Live Remote Script limits functionality. Very limited support for Kontrol Studio on iOS. Kontrol could do more in Gadget. Although there are less expensive portables, and more functional ones if you’re an Ableton user, nothing else matches the Nano Studios in terms of wireless convenience and features per square inch.